Can you still buy a WW II jeep for 50 Dollars? Small ads have appeared for years offering big bargains from government surplus auctions including ex-army jeeps and all kinds of other military vehicles. Army surplus clearout - everything must go! Jeeps still in original packing cases, complete with all original parts and accessories including : Axes, shovels, gas cans, service tools, grease guns, tyre pumps etc. etc. 50 Dollar jeeps? - We wish! The Gulf of Thailand - Still being dumped but a heavier type of military vehicle - tanks this time to form a reef. How did the 50 Dollar Jeep Rumour Start? Maybe just after world war two there were some crated jeeps for sale but the going rate even in the nineteen-forties was several hundreds of dollars not 50! Most of the jeeps that were made available for sale were well used and very few were crated in any event. The expense and trouble of putting something as large as a vehicle in a packing case was such that it was done on relatively few occasions. For shipping from the factory they would be stacked on top of each other in rail cars or shipped in partially 'knocked down' condition like in the picture above. 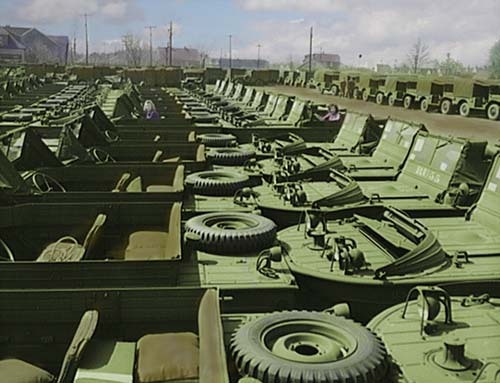 Most Jeeps were shipped fully assembled like these amphibious jeeps or 'seeps' awaiting despatch. 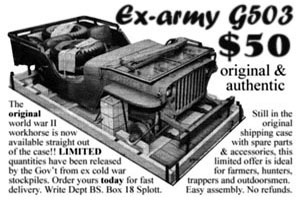 If a real ww2 jeep in a case turned up in some long-overlooked government store or abandoned barn, it would be worth far more left unassembled in the crate than it would be if you put it together and drove it around! But the Fifty Dollar jeep makes a great story and the legend will probably persist as long as someone is looking for a great deal! The jeep in a box is one of those urban legends that just refuses to die! Like all good stories, it no doubt has a grain of truth in its roots but that has long been submerged by scams and BS! Just a small line up of "genuine low mileage world war 2 jeeps". Who'd a thought there were any more world war two jeeps still in the crate?